Over the past week, astronomers have trained a network of telescopes around the world at a single point at the centre of our galaxy to finally catch a glimpse of a black hole. For five days, eight telescopes will point at one small spot in the constellation of Sagittarius termed Sagittarius A. Years of observations have revealed that Sagittarius A is likely the super-massive black hole at the center of our galaxy, and now these telescopes are working together to get the very first picture of it. Observing a black hole is not easy. It’s surrounded by a large cloud of dust and gas that’s impervious to most light. 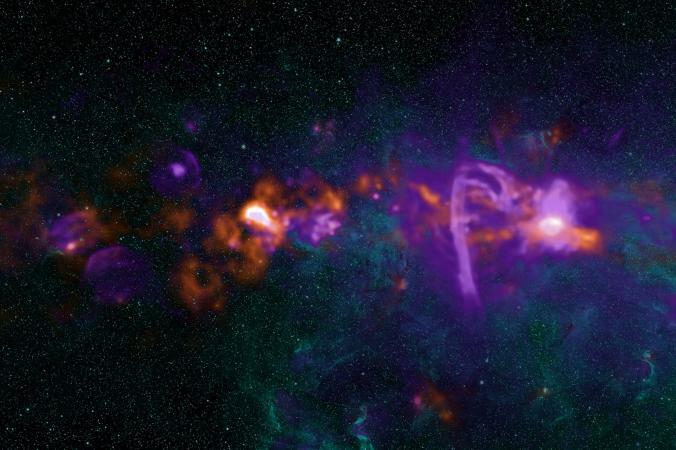 The telescopes that are making this most recent effort rely on radio waves in the narrow frequencies that can penetrate the dense nebulae around the black hole. We are joined live from Granada by Heino Falcke, a professor of radio astronomy and astroparticle physics at the Radboud University, to discuss the latest updates. Using a massive telescope network, scientists have data in hand that could open new frontiers in our understanding of gravity. For the monster at the Milky Way’s heart, it’s a wrap. After completing five nights of observations, today astronomers may finally have captured the first-ever image of the famous gravitational sinkhole known as a black hole. More precisely, the hoped-for portrait is of a mysterious region that surrounds the black hole. Called the event horizon, this is the boundary beyond which nothing, not even light, can escape the object’s gargantuan grasp. As the final observing run ended at 11:22 a.m. ET, team member Vincent Fish sat contentedly in his office at the MIT Haystack Observatory in Westford, Massachusetts. For the past week, Fish had been on call 24/7, sleeping fitfully with his cell phone next to him, the ringer set loud. As the last of the data arrived at project observatories, he watched celebratory comments come pouring in on a special chat line for radio astronomers and engineers. One noted that he was about to open a bottle of 50-year-old Scotch. Another was listening to the triumphant chords of Bohemian Rhapsody. “I’m very happy and very relieved, and I’m looking forward to getting a good night’s sleep,” Fish says. But that sense of relief is tinged with anticipation: So much data takes time to process, and the team must wait months to find out if their massive effort was truly a success. “Even if the first images are still crappy and washed out, we can already test for the first time some basic predictions of Einstein’s theory of gravity in the extreme environment of a black hole,” says radio astronomer Heino Falcke of Radboud University in Nijmegen, The Netherlands. “They are the ultimate endpoint of space and time, and may represent the ultimate limit of our knowledge,” says Falcke. Yet astronomers have only circumstantial evidence that they lie hidden at the heart of every large galaxy in the universe. Even Einstein wasn’t sure that they actually existed. Getting this far took years of planning and cooperation between international partners at observatories stretching from the tallest mountain in Hawaii to the frozen terrain of the South Pole. This electronically linked network of eight observatories created a virtual telescope dish as wide as the planet. Powerful radio telescopes around the world can be synchronized to work together, enhancing the effective resolution and sensitivity beyond what any single telescope could achieve. The great distances between this collection of installations, known as the Event Horizon Telescope array, actually increases their effectiveness. Known as the Event Horizon Telescope, the radio-dish network opened its eye on the heavens during a 10-day window that started on April 4. The Event Horizon Telescope has probed the neighborhood of each of these behemoths before, but this is the first time the network has included the South Pole telescope and the Atacama Large Millimeter/submillimeter Array (ALMA), a group of 66 radio dishes in Chile. ALMA sharpens the Event Horizon Telescope’s acuity 10-fold, enabling it to spot objects as small as a golf ball on the moon—and thus image the surprisingly small event horizons of the two black holes. After years politicking for observing time and outfitting each site with critical electronic paraphernalia, the team was ultimately at the mercy of something over which they had no control: the weather. Astronomers observe these black holes in millimeter radio waves, the wavelength band at which light can penetrate the dense concentrations of gas and dust at the center of the galaxy and travel relatively unimpeded to Earth. But water absorbs and emits radio waves, which means precipitation confounds observations. To minimize this problem, radio telescopes are placed at high altitudes—the tops of mountains or high desert plateaus—but incoming clouds, rain, or snow can still take an observatory offline. Buffeting winds at these high altitudes can also shut down a telescope. “The probability of having really good weather at every site is almost zero,” says Fish. With only five nights available during the observing window, Fish and his colleagues met daily to make the nerve-wracking decision whether to activate the network, juggling information about current weather conditions at each site and how those conditions might change over the coming days. From the MIT facility, Fish was constantly monitoring the weather at each site on one screen and communicating with astronomers on another. “It’s a heartbreaker if you fire off a night and [bad] weather closes in,” or if observations are cancelled on what turns out be a good night, says Shep Doeleman, director of the Event Horizon Telescope at the Harvard-Smithsonian Center for Astrophysics in Cambridge, Massachusetts. Now that all five days’ worth of observations have been completed, astronomers have a long wait—and months of analysis—to find out if they’ve produced a black hole portrait. Each observatory records so much data that it can’t be transmitted electronically. Instead, the information from all the telescopes—equivalent to the storage capacity of ten thousand laptops—has been recorded on 1,024 hard drives. The drives must be mailed to the Event Horizon Telescope’s processing centers at MIT Haystack and the Max Planck Institute for Radio Astronomy in Bonn, Germany. The hard drives from the South Pole telescope can’t be flown out until the end of the winter season there at the end of October. 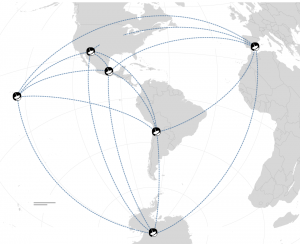 Once the data reach each processing center, a stack of servers will perform the all-important task of combining the time-stamped signals from the eight observatories. Comparing and combining the radio waves must be done with extraordinary care, so that critical information about the size and structure of the event horizon is not lost when they are added together. The technique of combining radio waves, known as very long baseline interferometry, is common enough in radio astronomy. But usually the telescopes are not so numerous nor spread out over such a large area. “We’re trying to make coherent a network the size of the globe, which is incredible when you think about it,” says Doeleman. What astronomers hope to finally see when they add up all the signals is a halo of light surrounding a dark circle—the shadow of the black hole. The crescent of light comes from luminous gases, heated to hundreds of billions of degrees, that orbit just outside the black hole, tracing the region just beyond the event horizon. Some simulations suggest that the halo may be brighter and thicker on one side than the other, resembling “a peanut that would not win any peanut beauty contests,” says Falcke. Even if they can’t generate an image from this observing run, Doeleman and his colleagues already have plans to try again next year, with an even larger network of radio telescopes. The Atacama Large Millimeter/submillimeter Array (ALMA) joins for the first time the Global mm-VLBI Array (GMVA) and the Event Horizon Telescope (EHT), Earth-sized virtual observatories, which are made possible by an international collaboration of radio telescopes. One of the main drivers of this global collaboration is to study in detail the supermassive black hole at the center of our Milky Way. 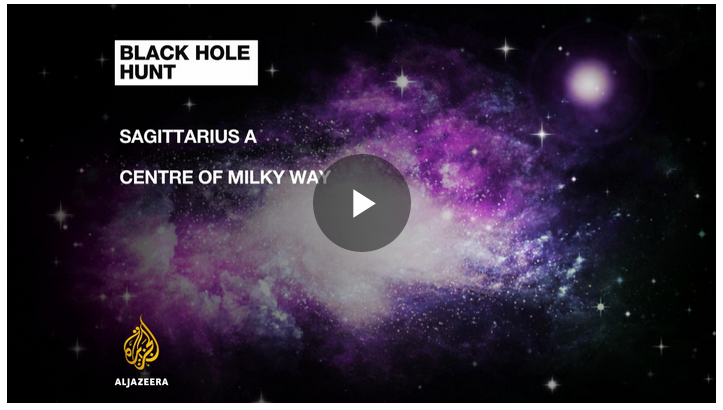 The GMVA will derive the properties of the accretion and outflow in the immediate surroundings of the Galactic Center, while the EHT will aim at imaging, for the very first time, the shadow of the black hole’s event horizon.